I have 18 2 foot squares and now realize I need something to hold them close to one another when I build my game at a convention. I am trying to come up with something easy. I have 10 inch earth magnets. I don't wish to glue them on side surfaces as they will add a crack when they go together on the panels. I can't think of any easy way to sink them into the sides of the panels. Has anyone had this problem and how did you solve the "amazing rifts between the earth" doing modular geomorphic terrain? I placed all of my boards on a large felt cloth. Holds them together quite well. A frame, or a belt of fabric wrapped around the outer rim would help hold them together too. Duct tape would work as well, but removing it would be problematical. A "belt" seems like the best, flexible option to me, other than the magnet technique. Depending upon what your boards are made of, you could drill them out to insert the magnets, in order to ensure a flush fit. That should work with foam and MDF. Foam will obviously be easier to drill into. I'd try strips of non slip matting… (I use it with Hexon). Suppose you put loop side velcro on the bottom of every tile. It doesn't have to cover the whole bottom, maybe just a 2 inch border. Then you use strips, maybe 2 inches wide, of hook side velcro to hold the edges of neighboring tiles together. I think that these strips should run parallel to the edges, so you have an inch of the strip on each of the tiles that you're joining. The strips should be short enough to leave the corners free, so that you don't have overlapping velcro there. I haven't tried it, but it's what I thought of. My terrain is made of EPS foam, and as mentioned above, a simple sheet of felt underneath keeps them from sliding around. Matter of fact, it is almost too good, as when setting up, you have to place each tile in exactly where you need it, as they will not slide into position. The "amazing rifts between the earth" might be caused by the sides of the terrain squares not being perfectly vertical. If so, one solution in the future is to slope the sides so that only the edges of the tiles meet. Thanks for all the suggestions. I also might try placing 10mm by 1mm earth magnets at the bottom of the adjoining pieces and stretch a connection underneath with a thin piece of tin. Will let you know what ends up working. 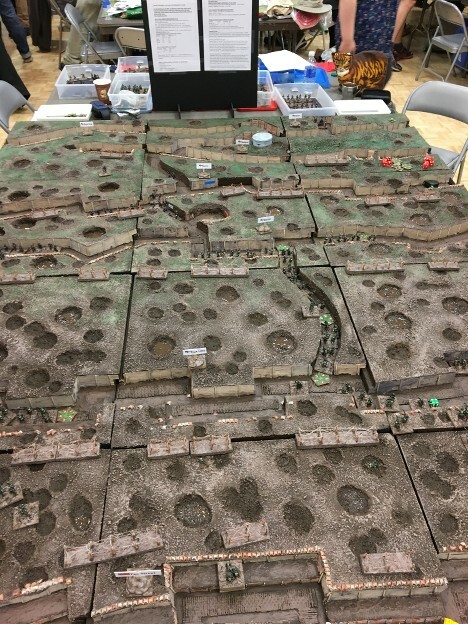 That is a 10mm army board. The project wont be worked on until late September as I have a big one involving 28mm figures I am working on until then. I always used to add lots of irregular pieces of scatter terrain to hide the straight lines on mine plus clump foilage or lichen. Straight lines and gaps are a major drawback with terrain boards or squares. I would go to a big-box builder's supply and get a long nylon belt with a slide-clasp and pass it around the whole thing. Then slowly cinch the belt tighter until the panels are all snug. Cheap and useful for a host of real-life uses too! The cinch, another good idea, Anton, and the price is right. Thanks.